Welcome to Ninaweb, the web interface of the Ninapro Project. The Ninapro project is an ongoing work that aims to aid research on advanced hand myoelectric prosthetics with publicly available datasets. From this page you can download the data and download related information. The databases are obtained by jointly recording multi-modal data, including e.g. surface electromyography (sEMG) signals, hand kinematics, hand dyanamics while the subjects perform a predefined set of up to 53 movements. A benchmark comparison between the different acquisition setups is thoroughly described in the paper: "S Pizzolato, L Tagliapietra, M Cognolato, M Reggiani, H Müller, M Atzori, Comparison of six electromyography acquisition setups on hand movement classification tasks, PLOS One, 2017". Dataset 1 includes data from 27 intact subjects. Dataset 2 includes data from 40 intact subjects. 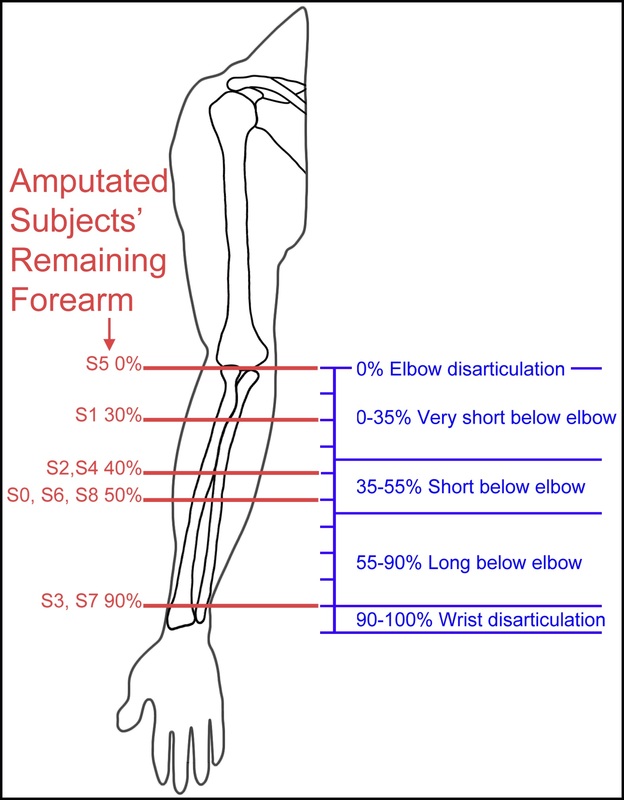 Dataset 3 includes data from 11 transradial amputees (with amputation levels as represented in the figure at the end of the page). Dataset 4 includes 10 intact subjects recorded with "Cometa" electrodes. Dataset 5 includes 10 intact subjects recorded with two Thalmic Myo armbands, putting them on the same forearm simultaneously. Dataset 6 contains repeatability data from 10 intact subjects repeating data acquisitions 2 times per day for 5 days. Dataset 7 contains data from 20 intact subjects and 2 transradial amputees. Despite intact subjects results can be used as a proxy measure for hand movement classification of hand amputees (Atzori et al., EMBC 2014), we recommend to include data from hand amputees whenever possible. Considering the data from amputees, several clinical parameters related to the amputation can significantly influence results, as described in Atzori et al., Journal of Rehabilitation Research and Development, 2016. This fact should be properly considered while analyzing the data and presenting the results. 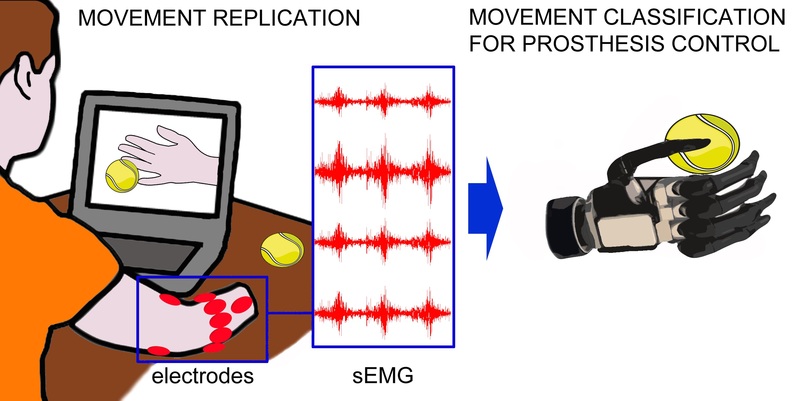 We really hope that you will enjoy the Ninapro repository, and that it will constitute a standard, widely accepted benchmark for novel myoelectric hand prosthesis control methods. Please, contact us if you would like to get involved into the project by adding new data.